This week’s pick is a hardworking little hero that should be a staple of any woman’s beauty kit. 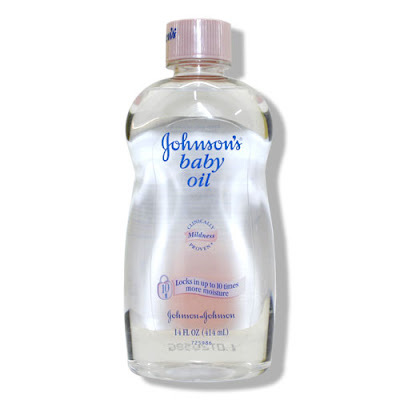 Johnson’s Baby Oil is not only a great multi-tasker but an absolute bargain to boot – my bottle set me back the princely sum of €1.99 when I bought it in a panic earlier this week. It turns out that applying your new gel eyeliner on the bus isn’t really such a great idea, judging by the strange looks and stifled sniggers when I arrived at work. Who knew?! Luckily I remembered a post by the gorgeous beauty blogger Art Donatella (who I met this week along with a few other lovely women from our little blogging community), listing Baby Oil as one of her most reached for products. I ran out for a bottle and some cotton buds and they cleaned up my messy make-up in a jiffy. The fabulous Rosemary Mac Cabe tells me the Baby Bedtime Oil makes for a relaxing evening body moisturiser and either version is great in the bath. You can also use the regular stuff in place of your usual shaving cream, on dry cuticles or cracked heels and, a favourite A-lister trick, apply to bare legs to make them seem longer and leaner. I’m sure there are myriad other uses for this versatile product and if you have any tips, please share ‘em in the comments! Ooh I have some of this sitting in my bathroom somewhere, must search it out :) Was great meeting you Wednesday, we'll have to have a proper chat next time! Must give the baby oil a lash for my eye make up, always end up ruining me muslin cloths when I wear a gel liner! Hey Roxy, definitely give it a try, I found it brilliant for this and only used a teeny bit on a cotton bud! I have a friend who uses it on her hair like a serum! I dunno seems a bit odd to me but she does have lovely hair!! Ahoy, that's a good pick! I also use this in the shower, before stepping out, while the water is still running, just apply all over the body (I actually lash it on), let is sink for a few minutes, it won't wash off because it's an oil, step out of the shower....and voila...'hello' velvet skin! I just followed thee, I had no idea how to do this, without the GFC'follow' button! All sorted now! Lovely to have met you on Wed! @ArtDonatella Thanks for the heads-up on it, it really saved my life when I had to fix up that dodgy eyeliner. @Make Up Fairy Would never have thought to try it on the lips, best alone or over lipstick? Thanks! Well, I use it as make-up remover, body oil after a bedtime bath, and as a cleaner for my cooker splash-back! And apparently it's supposed to be for babies! I've been to try Baby Oil since ArtDonatella mentioned it, I must remember next time I'm wearing gel liner. mmmm I love the smell of Johnsons baby oil, it makes me lovely and relaxed and sleepy and it's super moisturising. Never thought of using it as eye make up remover. I'll try think of it next time I'm struggling to get off my waterproof mascara. My mother used Johnson's Baby Oil all her life after her shower and she had the most beautiful skin. The smell of it reminds me of her so it gets a thumbs up from me! Also, the A-list trick works; a light cover of it on bare legs is gorgeous- even over tan! Aha! A fluffy product I can purchase guilt free! I only ever used it for massage purposes before... Thanks for the advice. Love your blog Emma.